Festival season is drawing to a close but some may say the best have been left to the last. With Bestival, Shambala, Reading and Leeds still to go along with Notting Hill Carnival, there is plenty of festival action left on the calendar to enjoy. Get into the spirit of the carnival atmosphere whatever festival you are heading to over the next few weeks by getting creative with your make up. 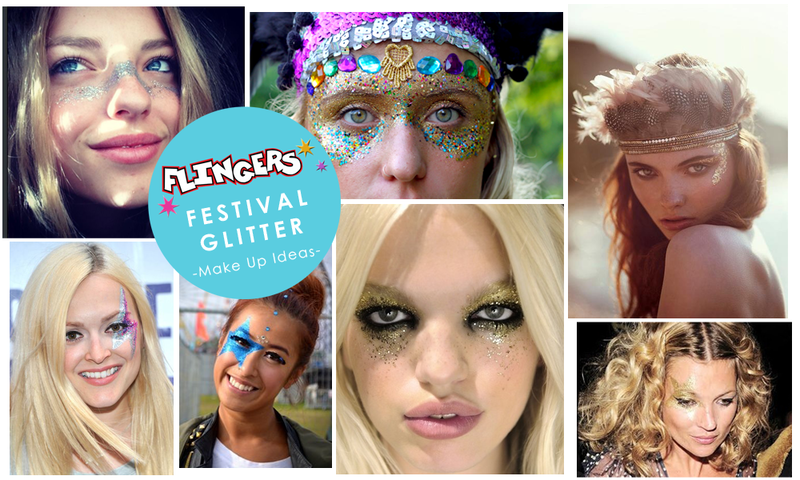 Glitter make up is the easiest way to add some sparkle to your festival outfits. We’ve been getting inspired by some awesome glitter face paint ideas. From glitter lightning bolts Fearne Cotton style to big golden stars Kate Moss style and much more. Use a coloured base of face paint to add more definition to your glitter and create a bolder colour. Don’t be afraid to use black eye liner to help define your features and define your glitter face paint design too. Stock up on your Glitter resources ready for whatever festival, carnival or party you still have planned this summer. And don’t forget your face painting brushes and sponges to help achieve a professional finish and get shimmering all night long! Glitter Gels from Flingers - Available in Gold, Red and Silver. However, if floral face paints are more your thing, remember to check out out Festival Face Paint Tutorial featured on the blog earlier in the year for some top tips! Order online now with delivery from just £1.40 or try out of brand new click and collect service. Have you tried out any glittery make up designs this summer?